Welcome to the webpage for LARC members who are interested in learning and using Morse Code, also known as Continuous Wave, or CW for short. Although CW proficiency is no longer required for a Canadian Ham Radio License, it is still a valuable skill, and a very useful mode. In general, you will be able to make more distant contacts, in poorer band conditions using CW, compared to voice. LARC is offering a Morse Code training course, which started on January 11, 2018. 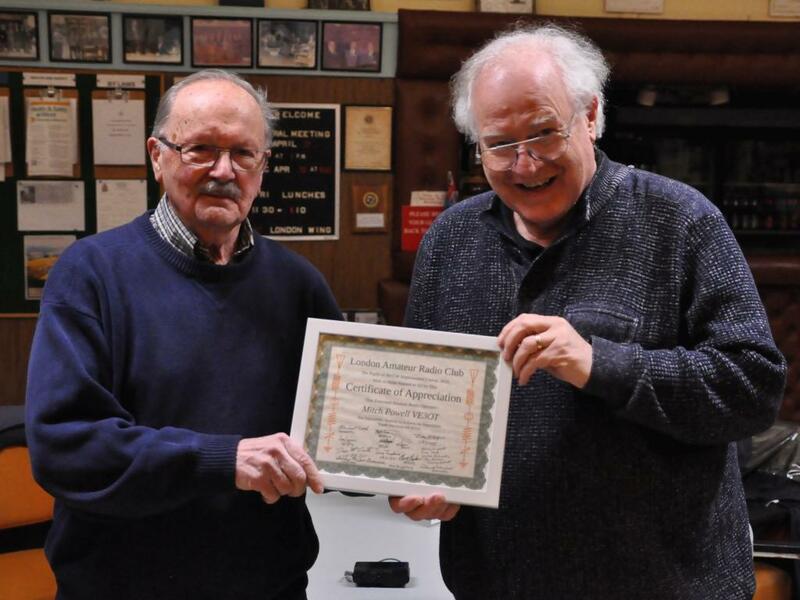 It's taught by Mitch Powell VE3OT, who teaches in our our Basic License Course, taught Ham Radio at Fanshawe College for over 20 years, and generally qualifies as an expert in many areas of our hobby. If the Basic course is any indication, this course will be both informative and entertaining. The course will be based on computer software that uses the Koch method of learning Morse Code. For background information (some of it surprising) on why this is the best way to learn CW, look at this article by Dave Finley, N1IRZ. The computer software enables the student to build reflex responses to the sounds of Morse at high speed and avoids building that lookup table in the brain that makes it impossible to get to high speed. Initially, we will be concentrating entirely on decoding or “copying” audible Morse Code, and will not be transmitting code until well into the course. Overcoming your “locking zone”: unleash your unlimited potential. Choosing the kind, make and model of key best suited for your skills and needs. Operating a Bug, sideswiper, straight, HST and paddle key. Running like hell: developing QRQ skills. The software we'll use is PC software written and supported by Ray Goff, G4FON. The first step is to get the software on your computer. You should get a file in your downloads folder called KochMorseTrainer Install.exe that is 977,473 bytes long. Doubleclick on the file to install it, and click in response to all the boring questions, including allowing it to create the new directory. When you start it for the first time, you'll get a pop up window asking you to send a QSL card. You can put this off until later - it doesn't impact the operation of the program. If you want to use similar software on an Android device (not recommended for course): You can get information from IZ2UUF's site and get his free software on Google Play: IZ2UUF Morse Koch CW I haven't tested this myself, and I note that is is written by a different author, and probably isn't identical to the G4FON PC software. From this point onward, we'll assume that you are using the official G4FON software. The others aren't recommended for this course, and you're on your own if you use them. The file KochMorseTrainer.exe should already be in this folder, and you may need administrator privileges to copy/move the 3 files. Personally, I'm not a touch typist, so I'm not going to explore this option for now. However, Mike Cook offers this advice to get the add-on to work properly: You have to start the G4FON program from the KB2TQX sub-program, and not have the G4FON program already running. Now that we have the software installed, it's time to do the set up needed so we can use it. First step is to start the program. The installation process should have created a short cut icon on your desktop that looks like the one on the left. If you can't find it, type G4F into the “Search programs and files” box, and it should appear. In either case, double click on what you've found and the program will start up. As mentioned above, the first time you run it, you'll get a request for a QSL card to be sent to G4FON, but you can defer that until later. Just click on OK and the program will still run. When the program starts, you will see a window that looks like the following. The actual character speed, item B, should be set to 15. This means that the dots and dashes that make up each letter will be short enough that you could fit 15 words into each minute. A word is nominally 5 characters long, with a following space, so 15 words a minute means 15 * (5 1) = 90 characters per second. The good news is that the characters will always sound the same, and you only have to learn the sound pattern once. The effective code speed, item C, should be set to 3 to start. This means that you will actually be hearing 3 words per minute. The same math gives a need for 18 characters per second at this word rate, so there will be some empty time between the characters. For now, that is, because we're going to crank this number up after we are able to recognize all the characters, and some short words, at 3 words per minute. Next step is to click on the Setup tab at the top of the screen. a new window will come up with 2 tabs: General Setup, and Morse Character Setup, as shown below. Make sure you're in General Setup, and then raise the Session Length in the lower left corner from the default 5 minutes to 10 minutes. Then click OK in the top right corner, and you'll be back at the main screen. Congratulations! you're now ready to do the assignments for each class, which are described in the meeting history below. Once you master the basic alphabet, numbers, and punctuation, it will also send random words or QSOs. 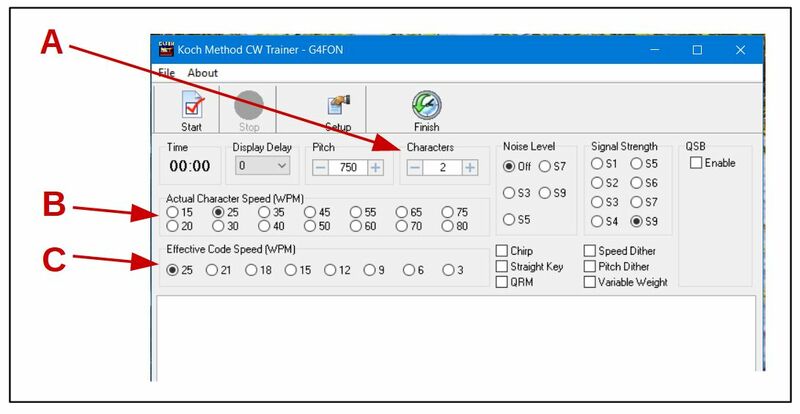 Also, the program has the ability to include realistic on-the-air conditions in the code, such as QRN, QSB, QRM, different signal strengths, chirp, pitch dithering, and variable weight. There is a KochMorse group on Yahoo that provides a user forum and support. Seems hard to believe we've come to the last class of the course, but here we are. Personally, I wasn't completely confident that I'd get to the point where I was able to transmit code, but there I was, pounding the brass when it was my turn to transmit to the class. Some people even copied what I sent! I think a lot of other people in the class have been pleasantly surprised that they've made substantial progress, and we have Mitch to thank for that. I know I'm not the only one who recognizes how much work Mitch put into the course, because the first message I copied from the student practice transmissions was THANK YOU MITCH FOR THIS CW COURSE. Continuing to provide good advice, Mitch pointed out that there are sub-sections of the low end of each band, and you probably want to be selective when you're starting out on the air. From B + .000 to B + .030 (where B represents the start of the band: 3.500, 7.000 or 14.000) there is a section inhabited by the speed demons. Probably not an ideal place for a green horn student to start out. It's also suggested that you listen to words as well as cipher groups. With words, you often get a sense of what's coming, and can more easily fill in any characters you miss based on the context. Mike Cook suggested copying CW using squared graph paper, putting one letter in each square. Anything that makes it easier is bound to help, especially if xxxxx when your speed gets up and its difficult to write fast enough. There was a concensus that we should move the weekday CW net to 28.505 MHz, to avoid birdies and other interference. Still 8 PM, and as part of the effort to mintain your CW activity, everyone should try to listen to, and join this net. You won't find a more accepting group, and all you need to know is the 6 (only 5 in my case) characters in your call sign to check in. As the meeting, and the course drew to a close, Dave McCarter presented Mitch with a Certificate of appreciation signed by all the students in attendance. Lots of handshaking ensued, and the words “thank you” were heard repeatedly in Mitch's vicinity. And thus, a herd of new CW operators were released onto the airwaves. Doug hasn't been doing a very good job of summarizing our weekly get togethers. Oughta fire the guy, or at least cut his pay <grin>. code practice hearing a common audio track over headsets. We experienced different speed combinations, and words rather than random characters. A lot of us hadn't done all of this before, and it was a bit of an eye opener. demonstrations and explanations of various physical morse code / telegraphy keys, and their operation. Some were museum pieces, some were recent DIY projects by students, and there were a lot of differences. various videos and presentations by Mitch. One of the more interesting described his experiences as a weather station telegrapher in the far North of Canada (Resolute Bay). Way too close to the North Pole for me. 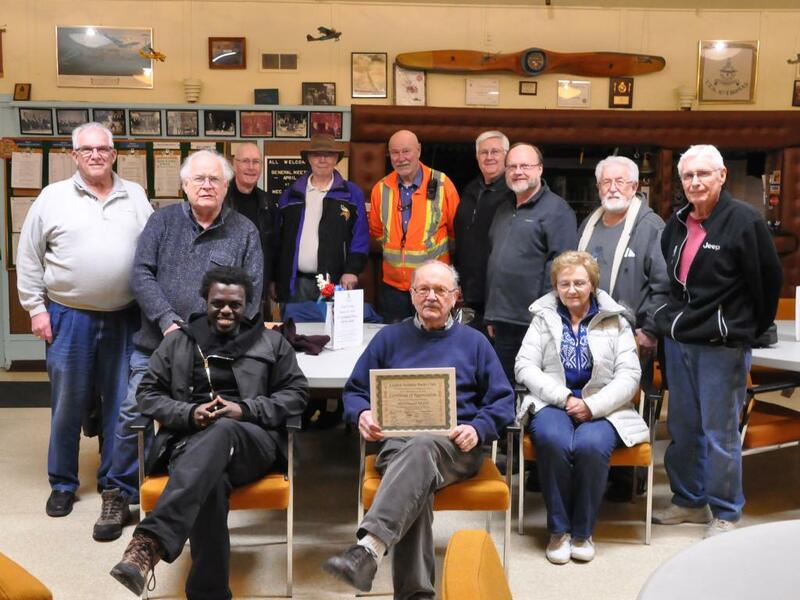 The March 15 meeting moved to the WIng near the airport, and Mitch passed the torch to Dave McCarter and Mike Cook to lead the fledgling CW operators to the finish line. We used an FM transmitter that Dave had created to transmit to an FM radio in the room. Some of the code came from a small CW practice device about the size of a deck of cards that Mike Cook had. Once again, we tried a variety of speed combinations, with words and random letters. A few brave souls tried transmitting, but there was an outbreak of shyness when use of the key was offered to the class. On March 22 we one again did some code practice, and a slightly larger group of people were willing to expose their transmitting skills. Doug Tompkins joined us as well. We spent some time going over the commonly used CW short forms, prosigns and Q-codes that we'll hear when we get on the air. Speaking of getting on the air, it was agreed that we'll start an informal CW net in the evening on weekdays to exercise our new skills. It will be a round robin style net, starting at 8 PM on the 10 meter band at 28.500, using upper side band. People can pre-announce their participation using the VA3LON VHF repeater, 147.060+, 114.8 PL tone, but we need to be careful not to interfere with the Monday night at 8PM on VA3LON. It was pointed out that we could also use phone as a talk around on the same frequency with this approach, although the whole point is to use CW. Read the “Zen and the Art of Radiotelegraphy“ book/file if you haven't already. It is very comprehensive and covers a lot of topics. We went over the stages of learning Morse Code, and some of the philosophical perspectives. Moral: stick with it and it will get easier. See handout below. note: you can change the font and size of the characters by right clicking in the open space, and then clicking “select font” at the top of the list that appears. We'll be using the audio distribution system in the lab next week - bring your headphones. Our first meeting on Thursday Jan 11, 2018 had a total of 22 people registered, although 5 didn't make it out to the first class. We saw a video that gave an overview of Morse Code, and visited the lab where we will be using the G4FON software on PCs, and listening to a central audio feed. Next meeting is Thursday Jan 18, at the same location. fixed some broken links. Either me, or the Wiki software is a bit buggy. Probably both. added advice from Mike Cook on how to get the add-on module from B2TQX for G4FON to run properly.